The funicular railway at CairnGorm Mountain. 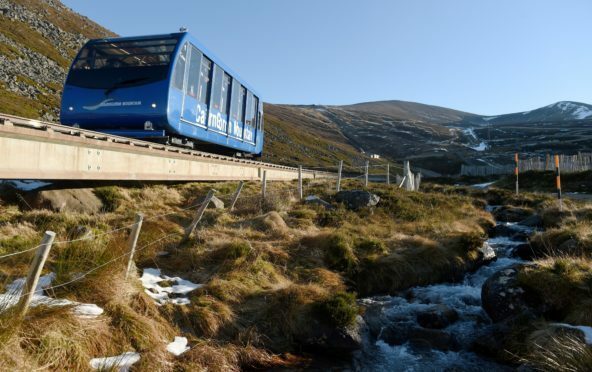 The UK’s highest railway will reopen today on CairnGorm Mountain following extensive maintenance work – just in time for peak summer tourist season. The work required the attention of a team of specialist engineers from Switzerland, as well as the mountain’s own mechanical engineering team. It included the replacement of the funicular haul/counter ropes, comprehensive inspections of the drive/counter bullwheels and special inspections of the gearbox. Coinciding with the kicking off of summer events, a partnership has been fledged between the CairnGorm Mountain and children’s illustrator June Armstrong. A selection of colouring sheets, a quiz and a variety of animal drawings have been produced by Mrs Armstrong, which will accompany the introduction of a new fun outdoor trail. Mrs Armstrong said: “It has been a pleasure to collaborate with the rangers to produce a fun activity trail. The first visitors on the funicular railway will have the opportunity to win a special golden ticket, containing a £50 voucher to spend at the centre.